Welcome to "Studying Tibetan Medicine". My name is Malcolm Smith, and I am a third year student at Shang Shung Institute's Program in Tibetan Medicine. I am one of the first 7 students to ever study Tibetan Medicine in a four year course on Tibetan Medicine in the West. In fact, no westerner has ever studied Tibetan medicine in a formal academic setting with the curriculum taught in English. So our program is truly historic. The inspiration for our program, and the founder is our wonderful teacher, Dr. Phuntsog Wangmo. Dr. Wangmo, or Gan-la as we call her, is one of the most highly qualified and respected Tibetan Doctors practicing and teaching here in the United States. She is a relative of Chogyal Namkhai Norbu Rinpoche, and arrived in the United States in 2001 where she began to slowly develop the conditions to begin our medicine program. It has been my pleasure to work with her closely since 2002 and to be her student since 2005. She is pictured here in the Library of Shang Shung institute, where she was conducting a lab on urine analysis last fall. Tibetan Medicine is based on a text called The Four Tantras (rgyud gzhi) which took its final form in the early 12 century. According Tibetan Buddhist accounts, The Four Tantras are considered a treasure text [gter ma], considered to have been concealed in a pillar by King Trisrong Desten at the temple of Samye in Tibet, and revealed again in 1035 c.e. by the one of the earliest tertons, a revealer of such sacred treasures, by the name of Trapa Ngonshe. From Trapa Ngonshe the lineage passed down to Yuthog Yonten Gonpo the Younger who finalized the text into's it present form and wrote the first set of comprehensive commentaries on the medical system presented in The Four Tantras entitled The Eighteen Branches which also contains an earlier recension of The Four Tantras. While the origins of the text of The Four Tantras is shrouded in legend, we can positively date it's official appearance on the scene with Yuthog the Younger. And so all Tibetan doctors practicing today owe a tremendous debt to this master. Yuthog was not only an amazing doctor, but he was always a highly realized yogi who revealed a profound cycle of Buddhist practice called the Yuthig Nyinthig which covered the entire path of awakening from the basic preliminaries to the most profound teachings of The Great Perfection or Dzogchen. This cycle of teachings is still practiced today by most Tibetan doctors. Tibetan Medicine was revived by the late Troru Khenpo Tsenam and his colleagues after they were released from prison by the Chinese authorities in the 1970's. In particular, the Chinese apologized to Khenpo Tsenam for imprisoning him, explaining that they did not realize that he was a doctor. 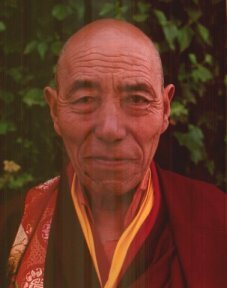 While in prison, Khenpo Tsenam [d. 2005] continued to practice and teach Tibetan medicine, and so trained an entire generation of doctors under the most difficult conditions. Traditionally, it is considered that Tibetan medicine comes from the ancient Rishis of India, and I feel that the compassion and wisdom of Khenpo Tsenam means that he was something like what these ancient Rishis must have beeen like. In general, although the work is hard, there is always so much to learn, and it often seems like I remember nothing at the end of the day, I feel totally grateful to all of the lineage masters of Tibetan Medicine. So it is my pleasure to share my experiences of studying and practicing Tibetan Medicine. So I hope you check back soon! I think it is a great idea to blog your experiences of training in Tibetan medicine. Good luck with your site and I;ll be checking back! Glad to hear of this blog.I found you through Esangha the buddhist forum. Can you give me any information on Tibetan medicine in regards to womens hormones and P.M.S ? If you need more information Malcolm i can give you more information just let me know.